First off, yes I am currently wearing an amazing Amazing Spider-Man t-shirt. Secondly, yes I am surrounded by comic books, comic book posters, mini Marvel module characters, a paper origami Scott Pilgrim figure and 2 small bottles of wine on my work desk. Life for me seems quite spectacular at the moment, and it is, but last night...last night was truly spectacular. After writing that I realize now that this next part is stupid and my comic of the day transition was lame. Whatever. Last night I finally got the first disc, of season 2, of The Spectacular Spider-Man (see...I worked in the spectacular angle), an animated series from a couple years back that was very well done. 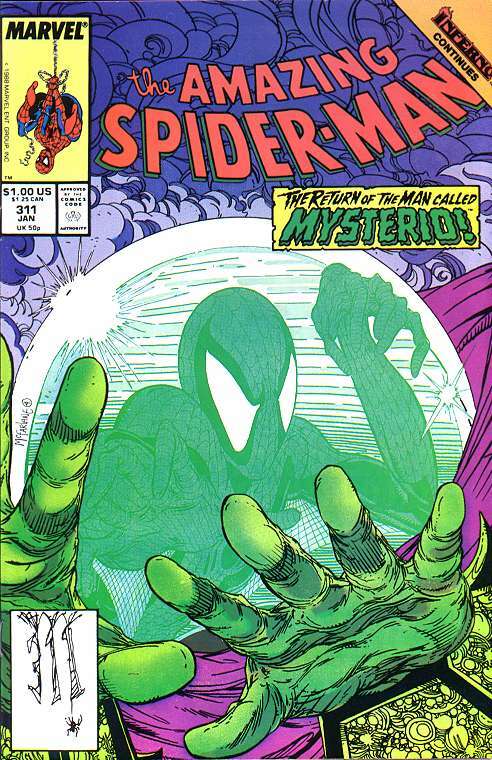 The first episode of the season involved the classic Spidey villain, Mysterio. While Mysterio is always a bit lame due to his costume design there are things that artists can do with him to spice up his image. 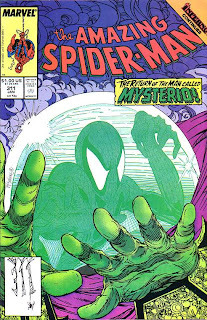 The cover of the Amazing Spider-Man #620 was a nice dome smashing cover, but almost exactly half an issue number ago on The Amazing Spider-Man #311, Todd McFarlane crafts a dome reflecting cover which has that classic McFarlane era touch to it that sets it apart as one of the greatest Mysterio covers of all time. Enjoy!